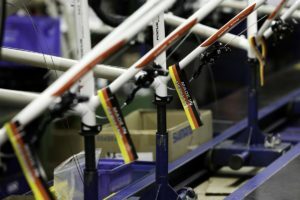 BAD SODEN, Germany – Before talking about German bicycle sales in 2007 we have to go back to 2006: a poor economy, dull overall mood and last but not least the World Cup – there was little scope for good bicycle product sales. There were also several factors influencing sales in 2007. But this time, the results were much more positive. First of all we have to note that cycling is a very weather-dependent business. “Bicycle sales go as long as it’s sunny and dry,” is a common saying. So in 2007: The ‘no-winter’ of season 2006/2007 harmed the international winter sports industry as never before, but led to a very early, warm and dry season opening for bicycles. This was the first and most important factor. Business was harmed again by a wet and cool June/July but picked up again for satisfying fall sales. Secondly the economy somehow stabilized, the consumption-harming increase of the German VAT tax was a done-deal and Germany’s ‘Joe Cool’ was willing again to spend a few more Euros. More importantly, the growth was seen not only in cheap no-name products that have been popular over the last years with the ‘Geiz ist geil’ (‘stinginess is cool’) mentality, but also in valuable premium brand sales as well. 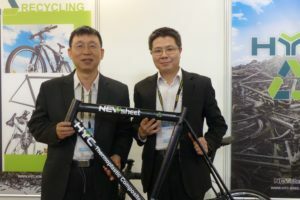 Moreover the rising oil price, environmental issues and the current hot topics of health and wellness were all features pushing bicycle product sales. Germany’s bicycle year 2007 in numbers: Total bicycle sales reached 4.582 million units. Compared with the previous year this is a 3.0% increase. While home production experienced a 3.6% decrease down to about 2.4 million units, imports rose approximately 13% to 2.757 million. ZIV also reports rising bicycle exports. They rose 19.5% to 575,000 units (see chart). According to ZIV, the value of overall bicycle sales 2007 reached € 1.686 billion. This resulted in an average sales price of € 368, up 6.7% on € 345 in 2006. The drop in Germany’s bicycle production led also to a drop in market share. With a market share of 39.8% domestically-made bikes fell below the 40% mark. They were still able to stay above this line in 2006 with 45.2%. “Last year’s drop in home production is rooted in the demise of some industry members,” notes Lemberg with an eye on traditional producers such as Biria, Kynast, Enik and Vaterland. The increase of bicycle imports comes mainly from a more than 300,000 units rise from Asia (plus 28.4%) as well as from other EU-27 member states (plus 31%). Even if Taiwan remains Germany’s no. 1 bicycle source (about 425,000 units), this dropped about 3.2%. An impressive increase of bicycle imports into Germany is reported from no. 2 Poland (about 350,000 units; more than 50% up). The major export markets for German-made bicycle were The Netherlands (120,000 units), Austria (99,000), the Czech Republic (52,000) and Switzerland (46,000). The good news for IBDs: They were able to increase market share to 59% (2006: 56%). According to ZIV almost 78% of the total bicycle turnover in 2007 (bicycle and parts/accessories) was made through Germany’s IBDs. The second largest bicycle sales channel was DIY markets and departments stores (34%, 2006: 36%) followed by Internet sales (5%, 2006: 4%), mail order suppliers and ‘Others’ (1% each, 2006: 2% each). The ‘mobility segments’ of trekking and city bikes are big. In 2007 they reached 32% (2006: 30%) and 23% (2006: 25%) market shares respectively. Third was MTBs (12%, plus 1%), fourth so-called ATB’s (StVZO/fully-equipped mountain bikes) with an 11% market share (2006: 13%, minus 2%), followed by road/fitness/cross bikes (7.5%, minus 0.5%), juvenile bikes (6%, plus/minus 0), kid bikes (3%, plus/minus 0), Dutch and touring bikes (2%, plus/minus 0), ‘Others’ (2%, plus 1%) and e-bikes (1.5%, plus 0.5%). 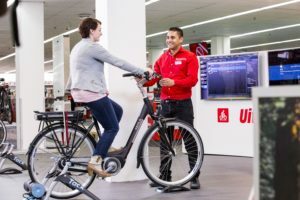 E-bikes gained an impressive market share and are forecast to continue to grow: the ‘Others’ category with recumbent and folding bikes was already able to double its market share in 2007 compared with 2006. Here the trend over the coming years is definitely upwards. 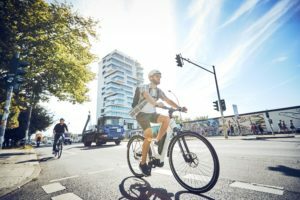 Due to the overall results in 2007 which balanced the previous year’s negative story, Germany’s bicycle parc grew from 67 to 68 million units, says ZIV. And it is set to increase further. Bicycle rental systems not only in Germany but also all over Europe are picking up. Paris’ impressive rental fleet Vélib is a benchmark. London has announced an investment of almost GBP 600 million (EUR 760.6 million) in bicycle infrastructure and use. 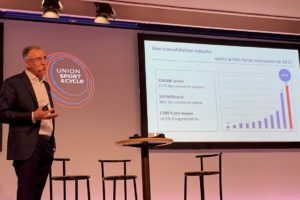 German Call a Bike, a bike rental system in the hands of German Railway subsidiary DB Rent, is constantly growing. Moreover the 2008 season got off to a good start due to another mild winter in 2007/08. Nevertheless a cold breeze over the Easter holidays and in April impacted business again. But the hope is up for summer 2008 and warm, dry and sunny days.